A fossil fuel divestment protest outside the University of Washington in Seattle. Photo courtesy of Seattle.gov. During a breakfast he recently hosted in a K Street bar, American Fuel & Petrochemical Manufacturers President Chet Thompson leaned forward in his seat and said his industry isn't sweating the fossil fuel divestment movement. "Worried's not the right word," said Thompson, whose member companies includes firms like Valero Energy Corp., Dow Chemical Co. and Husky Energy Inc. "We're not worried, but we do think this is a part of a broader campaign." That unruffled demeanor isn't unusual among industry officials, who since the divestment effort urging investors to sell coal, oil and gas holdings began apace in 2014 have dismissed the boycott as politically motivated, symbolic and ultimately feeble. Yet while fossil fuel companies deny the campaign is affecting them and American Fuel & Petrochemical Manufacturers (AFPM) has until now largely stayed out of the debate, the breakfast is one of several recent signals that business leaders are now hitting back hard against a growing threat to their sectors. In recent weeks, fossil fuel trade groups in Washington, D.C., have ramped up efforts to control the conversation around divestment, issuing statements, producing research and publishing surveys. "I've definitely seen the industry push back a lot more, more recently," said Chloe Maxmin, co-founder of Divest Harvard. She cited as an example DivestmentFacts.com, a website the Independent Petroleum Association of America (IPAA) runs. "Sometimes I think about their reaction as part of the five stages of grief -- grieving the end of the era of fossil fuels," Maxmin said. "The first stage is denial, and then the second stage is anger, and the third stage is bargaining, which is I think what this falls in." Indeed, the fossil fuel divestment movement has had some wins of late, such as the vote by Berlin's Parliament last week to divest pension investments. After officials at the Washington, D.C., city pension fund announced June 6 they had sold off direct holdings in coal, oil and natural gas, the American Petroleum Institute (API) called the decision a "tactic of misinformed activists" likely to lose money. "Millions of retirees and pension holders depend on income from oil and natural gas investments to live," an API spokesman said hours after the announcement. Two days later, the IPAA released a survey of pensioners' views on divestment and said the D.C. fund's action didn't include commingled funds -- investments like mutual funds that charge fees when sold. "No one seems to know or particularly care what actual pension beneficiaries think about these policies," said IPAA Senior Vice President Jeff Eshelman, adding that the poll found pensioners "don't like these divestment schemes one bit." Eshelman followed up with a column critical of divestment in The Hill newspaper a week later. Matt Dempsey, an IPAA spokesman, said his trade group and others have made an effort to get ahead of campaigns by anti-fossil fuel activists on issues ranging from divestment to hydraulic fracturing. "It's all about providing facts and information on this topic," he said. "Companies want to make sure they're represented." Brad Hager, an earth sciences professor at the Massachusetts Institute of Technology opposed to divestment, called the recent industry responses understandable. "It's natural for these companies to be concerned about their image," Hager said. "They may have tried being quiet for awhile and it didn't go away, so now they're, I guess, trying to counter it to some extent." The fossil fuel divestment movement, which targets the holdings of colleges and universities, pension funds, religious institutions, and other long-term investors, can be traced to a student divestment campaign at Swarthmore College in 2010. Since then, environmental activist and 350.org founder Bill McKibben has led the push. So far, more than 500 institutions that oversee more than $3.4 trillion in assets have pledged to divest from coal, oil and gas holdings to some degree, according to 350.org. Still, just a sliver of that sum -- $50 billion -- has been divested from fossil fuel investments, based on 2014 figures from the group. Industry has been squaring off against the movement since the beginning. As early as 2013, API was fighting divestment legislation in the District of Columbia, according to a compilation of remarks filed with the D.C. City Council. "Divestment, which leads to the erosion of state and municipal employees' hard-earned nest eggs, is not the way to go," API's Drew Cobbs wrote at the time, arguing the fossil fuel industry underpins almost 10 million American jobs and 8 percent of the U.S. economy. But efforts to dismantle environmental groups' economic arguments began in earnest last year. Since 2015, the IPAA has commissioned three reports and three surveys on the effort. API has released two reports in that time period on the costs of pulling out of fossil fuels by Robert Shapiro of Sonecon LLC, a private consultancy. And AFPM issued a personal challenge to McKibben to not use "anything to do with fossil fuels" for a week. "We know how active the divestment activists are on trying to make this effort seem bigger than what it is," Dempsey said. Like a couple married for decades, both sides are familiar with the other's arguments and rebuttals. Divestment critics say the divestment effort is politically motivated and question the movement's funding from left-leaning groups, including the Rockefeller Brothers Fund and the Tomkat Charitable Trust, a charity of the billionaire environmentalist Tom Steyer. They argue selling shares is fruitless and hypocritical since coal, oil and natural gas fuels are so pervasive and such investments have been and will continue to be blue-chip stocks. The divestment campaigners rejoinder: The industry is morally questionable and simply because a business model has provided great wealth doesn't mean it has a rosy financial future. At least six companies, primarily coal firms, have told the U.S. Securities and Exchange Commission that the divestiture push threatens their business and has lead to at least 10 banks shutting off coal industry loans. Spokespeople for the American Gas Association and the Interstate Natural Gas Association of America, Washington trade groups, said their firms don't appear to be in the divestment crosshairs. And the utility trade association Edison Electric Institute said their members hadn't been affected either. Of the schools that have purged shares from their endowments, some have just gotten out of more carbon-intensive sectors such as coal, an industry already hemorrhaging cash. Georgetown and Stanford universities have sold direct positions in coal stocks alone. Other colleges have only blacklisted oil-sands firms from their portfolios. And a few, such as Syracuse and Oxford universities, have announced they would divest from extraction companies only to later disclose they never held such holdings. 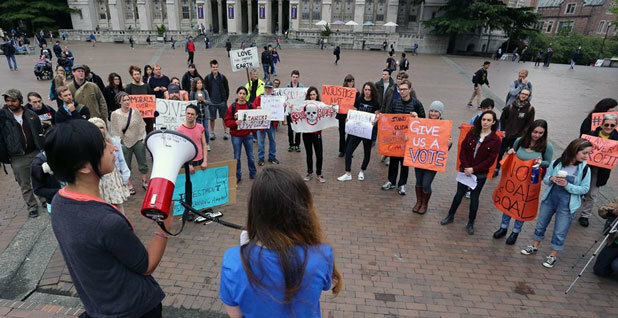 "We've seen about a dozen small schools, I mean I'm talking really small schools, that have fully divested and actually done what the activists wanted them to do," Dempsey said. Whether the divestment movement is succeeding is an open question. Rachelle Peterson, director of research projects at the National Association of Scholars and a critic of the movement, said the campaign has not made an economic dent in coal, oil and natural gas companies. It has, however, amplified the topic of investment and global warming -- something she said she does not believe is occurring. "If the question is, 'Has fossil fuel divestment affected the larger national political scene?' the answer to that is clearly yes," said Peterson. "It preys off of students' needs to be part of a larger moral campaign. "Students are learning to take pride in being arrested and flouting rules," she added. "It's also linked in many cases to a larger climate of intolerance." But divestment campaigners say the recent backlash is a sign that their movement is working. "If you follow the money, I think it's pretty obvious that this is coming from the fossil fuel industry," said Matt Grason of DC Divest. "The fact that they say that it's useless and have to publish newspaper articles and reports about it points to the fact that they're concerned about it." David Turnbull, campaigns director at Oil Change International, agreed. "You don't take an ineffective campaign seriously if you're the industry," he said. Correction: Because of an editor's error, a previous photo caption misstated the location of the divestment protest. It took place at the University of Washington in Seattle.